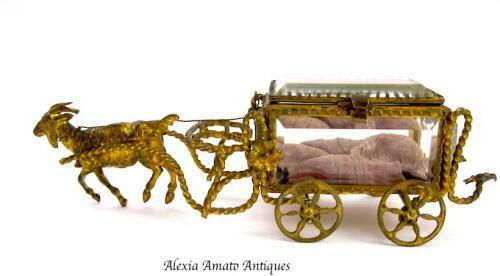 Antique French 19th Century Dore Bronze Goat Cart Pulling a Bevelled Glass Casket. The Casket is a Nice Size to Hold a Scent Bottle or a Piece of Jewellery. Box 8.5 cms Long x 4 cms High x 4.5 cms Deep.